Anticipation ran high as Måns and yours truly zipped along on the train destined for the summer cottage. We had both managed to get Friday off work and were looking forward to two full days of outdoor activities and… training. Among our sparse luggage was a heavy-duty rubber mat designed to cover any ice or snow that might be found in the rack. Helsinki was still void of snow, but at this time of the year the conditions 400 km/250 miles up north were hard to predict. Here’s the full story brought to you by your very own household guy under the bar. Let’s rewind the story a bit, shall we? Earlier in the day, Rufus and I joined Måns to the veteran of fitness stores in Helsinki. In operation for more than 35 years, Wrange carries a hybrid mix of modern fitness goods and old school fitness buff stuff. We were actually surprised to find state-of-the-art protein tablets on the shelves. 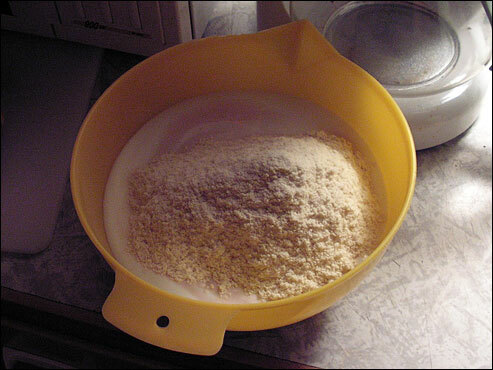 I use to choke them down with water by the handful - at 0.8g protein each you do the math for 40 grams of protein - long before whey protein came around. Gently shaking myself out of bodybuilding nostalgia, let me tell you that the real cause of our visit was one slippery problem. Having been greeted by one skinny yet surprisingly muscular barbell hosting gent at the entrance, I dashed in to order one of their kuntolaitematto, or gym mats in a more international vernacular. Sold off a 1.25m/49″ roll, I figured a 1.9m/75″ long piece worth 104.5 euros would be just enough to cover the base of the rack while leaving a couple of flaps to use under the bar if needed. With a thickness of 8mm/0.3″, this mat was advertised as being very resilient and non-slippery even when wet. This is basically the kind of mat you find in freeweight areas or under machines in many gyms. Gracious as always, Måns promised to bring it to the train station as he was arriving by car. He ended up getting caught in the traffic and had to make a serious dash for it with the 16 kg/35 lbs mat jumping over one shoulder and the gym bag swaying off the other. One funny sight, but he made the train. Thanks, dude! Waking up Saturday morning, late by my standard, early by Måns’s, we had breakfast and leaped out to assist dad in preparing the place for winter. 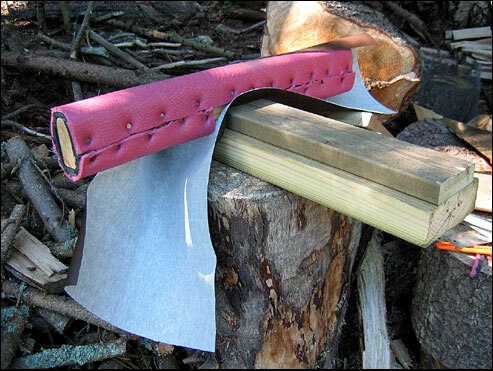 After a lot of carrying this and covering that, we took on the mount of unchopped wood still loitering about the shed. A few smaller trees also hit ground zero. 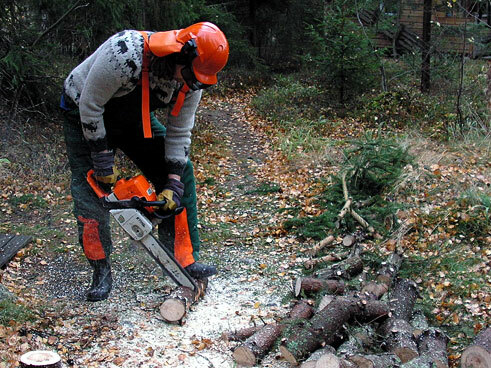 Here’s me doing some small-scale chainsaw massacring in my favorite woolen sweater; knit by my mom, it features yaks across the chest and sheep along the waistline… a nomad enthusiast’s dream. 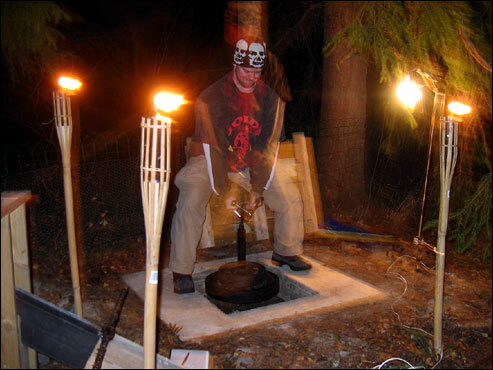 Time had sneaked up on us and we were too hungry to hoist even the smallest of iron plates. Food break! My perverse fascination with sushi should be well-known by now, but kebab is not far behind. We had stocked up with a load of kebab meat and pita bread. 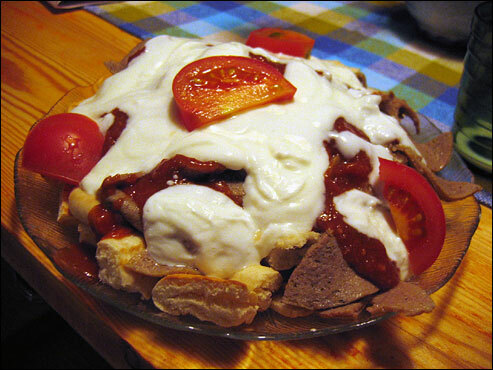 I quickly whipped together my standard kebab sauce and poured youghurt over the small mound. After finishing off one serving (above) each, we were now too full to train. 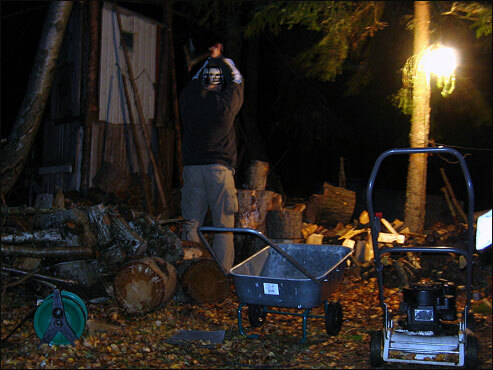 We dragged ourselves out for some more woodchopping to let things settle a bit. Not what I’d ordinarily have as a preworkout meal, but this was no ordinary excursion. By this time, darkness had descended on the island. A light bulb at the end of an extension cord did the trick. 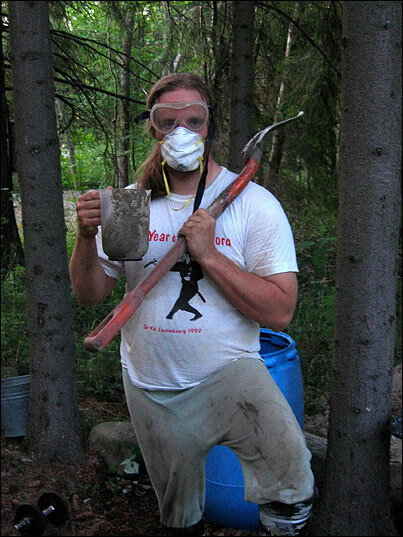 This is Måns popping away with the axe. To the left is my old two-story fortress built around three trees… once a stronghold with the largest arsenal of wooden swords known to man. But I digress… ah, memory lane. At 10pm we were, digestically speaking, ready to rumble. A few torches from the End of Summer festival and two electrical lights lit up Toffe’s Gym, now transformed into a dreamy landscape of warm light and dark shadows. The music coming out of the small speakers attached to my iPod was nothing but a faint backdrop drowning in the cold breeze. The temperature was barely above freezing at 2°C/36°F. Quite refreshingly pleasant actually. 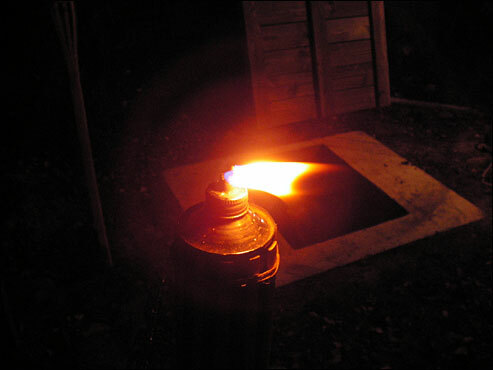 This is the uncovered weight pit illuminated by a torch (duh). With the mat in place, the rack was ready for action. It was after midnight when we finished. The workout is not one either of us will forget in the first place and I can safely say that it has been firmly added to the ever-growing list of nostalgia. Instead of the normal post-workout shakes, we had a liberal amount of protein powder mixed in with yoghurt before departing for Dreamland. It had been a full day. The next day, Sunday, it was time to wish Toffe’s a nice winter. We did entertain thoughts of training, but the temperature dropped rapidly below freezing and we even had some snow. 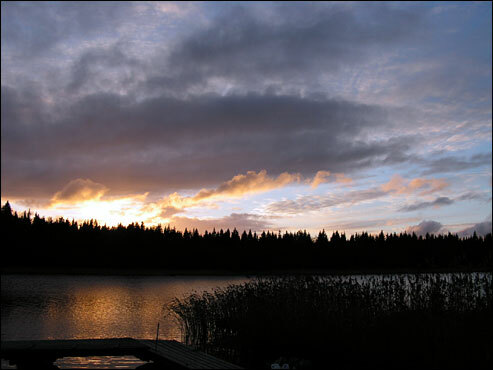 Click on the image to see a larger panorama. 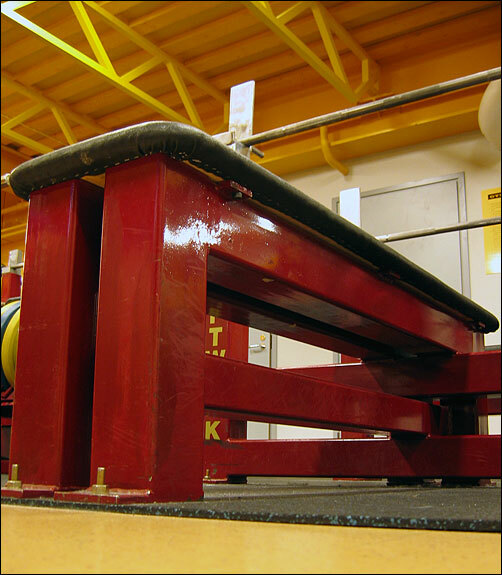 We covered the bench and put the squat box underneath it inside the rack… the mat got to spend its first winter indoors. A last look at the goodies before covering the weight shed with a filthy expensive 99 euro tarpaulin made of the same thick PVC used for covering trucks. Note the covered rack in the background. Heavy snow fall now welcome. The sun was setting beautifully as we hopped in the boat for the ride home, this time in dad’s car. Until next year! A BIG thanks to Måns for all the help during the weekend and for allowing me to use his photos! The power rack project left behind a few sacks of concrete. Not wanting to waste that, figured I might just skip a few beats and ditch the wooden weight pit for a concrete one. After all, the few workouts I’ve done in it so far has convinced me this is one heck of an attraction. I started work on this three weeks ago on the eve of leaving the summer cottage for the regular job in Helsinki. 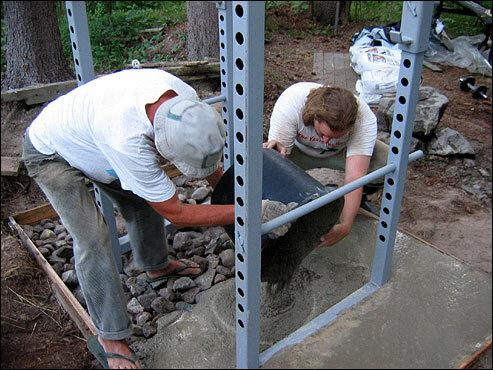 I did the frame one day until midnight, and then worked like a maniac the next day to get it all concreted before hopping on the southbound train with Rufus and Sanna. 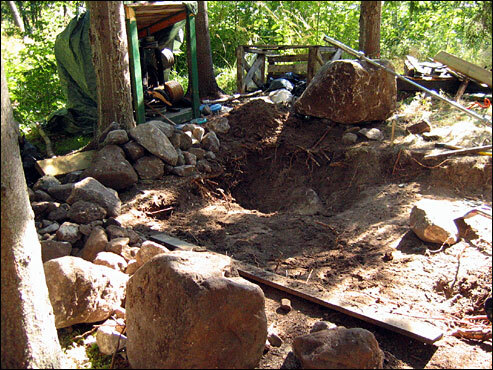 As we returned to celebrate the traditional Ostrobothnian end of the summer season on the last weekend of August, I got to uncover the now dry pit. Here’s the more than a thousand words thingy. Step one: reluctantly tear down the “old” wooden top structure one has invested several hours in making, then put in an outer frame for the concrete and painstakingly make sure it is level in all directions. The inner frame in place. Notice the sheet metal that keeps the concrete from flowing down into the pit. 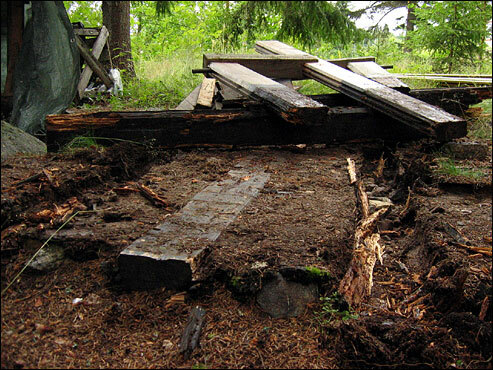 The wood was ripped from old boards that once made up the weight shed at Toffe’s gym. 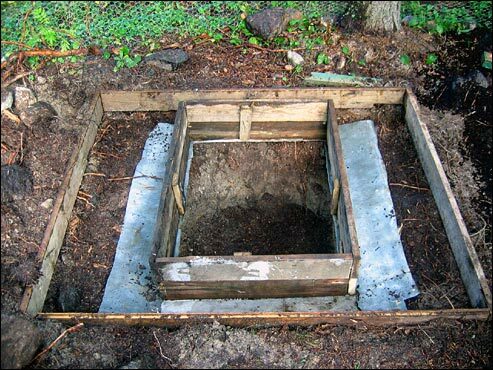 The measurements correspond closely to that of the wooden pit, i.e. depth 60cm/23.4″, length 84 cm/32.8″, width 65 cm/25.4″. Partially filled frame. As usual, a few stones decorate the bottom in order to save some concrete. After sweating bucket loads whipping up several bags of concrete by hand, the frame was finally filled and the concrete carefully levelled out. Joy to the world! 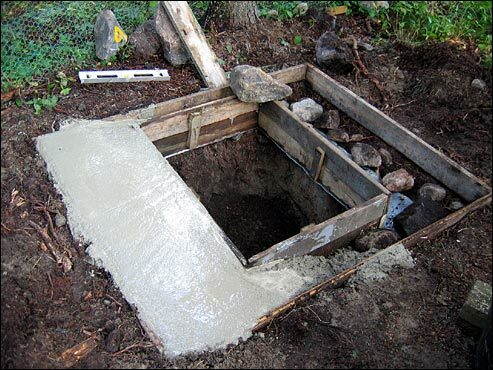 Ideally, concrete should be allowed to settle for a couple of days covered up to prevent moisture loss. The painted stones are fossiles from the flintstone’s era at Toffe’s when I used stones in buckets for resistance… This is how I left the pit before rushing off to the train via a quick dip in the sea (concrete in the ears does not make for a good public impression). The uncovered pit upon the return a couple of weeks later. Guess who couldn’t wait to try it out… here the Ironmind loading pin is loaded to 60 kg/133 lbs for some light handle squats. Here’s the video (1.7M). Holes in forests can be a deathtrap to both animals and humans alike as a poor mouse who fell into it can attest… not to mention how fun it is to step into a pit like this in the middle of the winter. For peace of mind, I nailed together a solid lid made of treated wood I bought for the purpose. I made sure to leave some gap between the boards to allow air to circulate (”hey, wanna try some handle deadlifts in my stinky pit?”). Mission complete. The renovation of Toffe’s Gym continues. 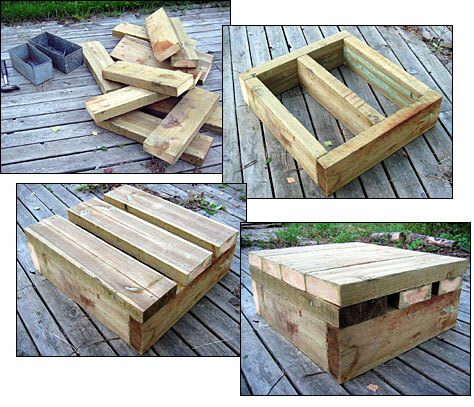 With my old squat box having emigrated to Helsinki, it was time to build a new one. Following the “good enough for Mikesell” line of thought, it had to be a much sturdier thing adjustable to at least 10″ (my low box), 13″ (below parallel) and 17″ (high box). The solution was to build a 10″ base box with separate 3″ and 4″ add-on layers - on the Westside tapes, most boxes are also piles of something. The add-ons will also be handy for things like elevated deadlifts. Since I opted for a concrete base for the power rack, I was left with a bunch of treated 2x6″ boards that I now put to good use. Made the box a respectable 24″x26″ (61x66cm), significantly wider than the 18x18″ adjustable squat box from EliteFTS . With nearly 8 meters/26 feet of 2x6″ going into the base box, you can image how heavy this beast is… Once everything was hammered together, I grabbed the magnifying glass and burned the strategic numbers into the wood. Done. Pile to finish - the building of the 10″ base box. The complete box with 3″ and 4″ add-ons. I don’t know why, but declines is the exercise I have most associated with the renovated Toffe’s gym. 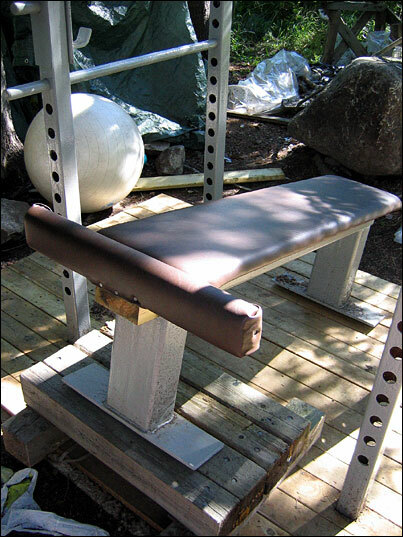 The bench is easy enough to decline by raising one end, which is also how the Westside guys do their declines on the pre-2004 Bench Press workout tapes, but trying to do declines without leg support is like having Humpty Dumpty ski backwards down the Rockies. Since the bench main frame is open at both ends, making a removable support was as easy as some wood coupled with left-over padding and artificial leather. Maxing out next. In terms of physical length, this ought to be the longest entry so far and by far. 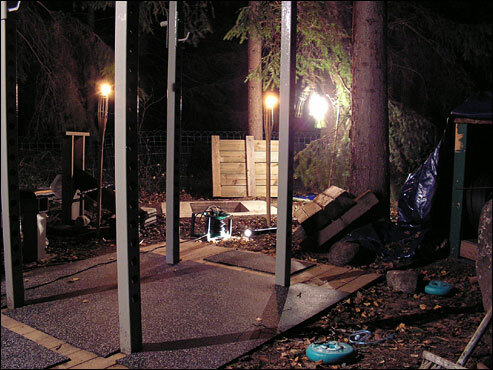 Unfolding below is a full pictorial over how I designed and implemented a power rack and heavy-duty bench in my forest gym in Finland. The process turned into a long one and, as a result, some of this information can be found scattered over the archives. This is an attempt to pull that already told together with the final word in the hopes that it might be useful to someone somewhere sometime. Before we get on with it, let me just make it crystal clear that I am not an engineer. I did consult some people in the know about a few details, but generally speaking, this walkthru makes no pretence to be the right way. In fact, if you think I took a wrong turn somewhere your comment could save another home gym maker from following in my would-be footsteps. Let’s roll! Built in 1996, my second wooden squat rack had served me well as a bodybuilder. Now, this focal point of Toffe’s Gym was about to be replaced by a powerlifter’s best friend, Mr. Rack, and his sidekick, Mr. Bench. For further reference, note the stone lying to the right of the rack. You got to begin somewhere. In my case, figuring a welder can’t be too hard to find, I decided to first secure the iron. For a mere fourth of the retail price, I found everything I needed at the local junk yard. The iron was covered with a thin layer of surface rust, but my uncle, who knows about these things, assured me that it would be as good as new. After having thought over the design during a few weeks away from Toffe’s Gym (see the inspiration appendix), I returned to the junkyard with a grocery list in my pocket and our neighbor’s trailer behind my parents’s car. I knew the length of material I needed, but picked the actual dimensions on spot based on what was available. As I laid my eyes on some massive 100x150mm/3.9x5.9″ pipe, I got inspired to make a monstrous bench capable of supporting a tank or two. Another customer told me he was going to use the same thing as the main support beam of a large roof. The junk yard guy was kind enough to cut the material according to my specs. The edges basically consisted of melted iron as he used gas, but he made sure there was a reasonable safety margin on every piece. The loot. 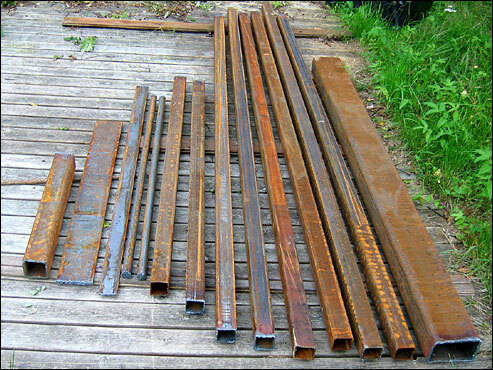 From right to left: 100x150mm/3.9x5.9″ pipe (10mm/0.4″ wall thickness) for the main frame of the bench, several pieces of 60x60mm/2.4x2.4″ pipe (3mm/0.1″ wall thickness) for the power rack frame, two pieces of 30mm/1.2″ iron rod for the safety pins, a 60 mm/2.4″ wide strip for the rack hook, a 120mm/4.7″ wide strip for the bench legs and a piece of 80x80mm/3.2x3.2″ pipe (5mm/0.2″ wall thickness) for the rack hooks. Total price 140 euros, or 174 US dollars according to the current weak dollar rate. One of the big question marks was what kind of flooring the rack should have. After considering everything from concrete to a strip of asphalt road, I decided to sink the sides of the rack into concrete and build a wooden floor around it. 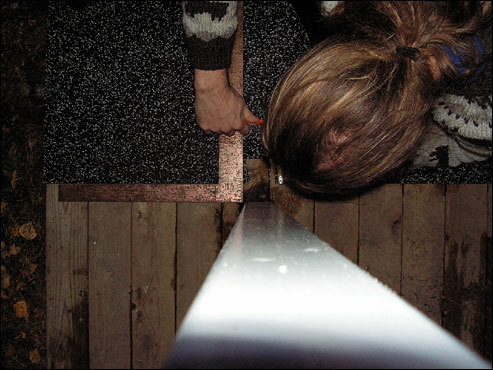 This would entail renewing the flooring every few years, hence I got treated wood to get the most out of it. I returned from the lumber yard with 155x55mm/6.1x2.2″ support beams for 3 euro per meter/3.2 feet and 97x20mm/3.8x0.8″ floor boards at a discounted price of 0.8 euro per meter/3.2 feet. Paid 40 euro for all 50 meters/164 feet of wood, but later picked up some more beams to correct a slight miscalculation on my part. Now it was a simple matter to draw blueprints for the welder. I wanted the rack to be tall enough for standing overhead presses, deep enough to cater for more spacious movements like good mornings (but no more as to keep the rack as sturdy as possible) and completely open-base (I don’t like obnoxious racks who think they can tell me how wide I can go on squats and sumo deadlifts). In practice, this meant a height of 2.6m/8.53 feet (out of which 30cm/11.81″ would go underground) and a depth of 0.7m/27.6″ between the uprights. 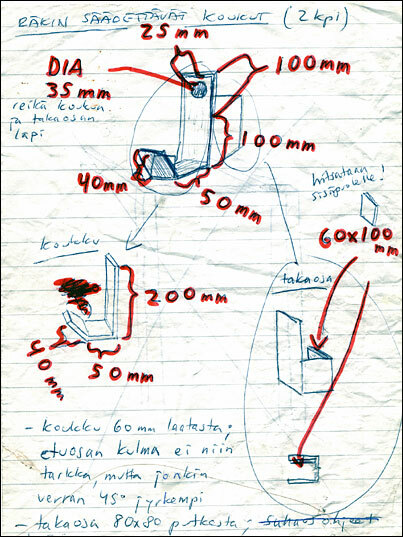 The number of holes in the drawing is not accurate, but a note was made that they should be drilled every 3cm/1.2″ beginning at 50cm from the bottom (note that the drawing says 60cm, but I changed this later) to about 30cm from the top. To keep rain out, the welder was asked to cover the open ends with pieces of the 60mm wide strips. Contrary to the blueprint, the final diameter of the support pin holes was 31mm/1.2″; a perfect fit for the 30mm/1.1″ pins. 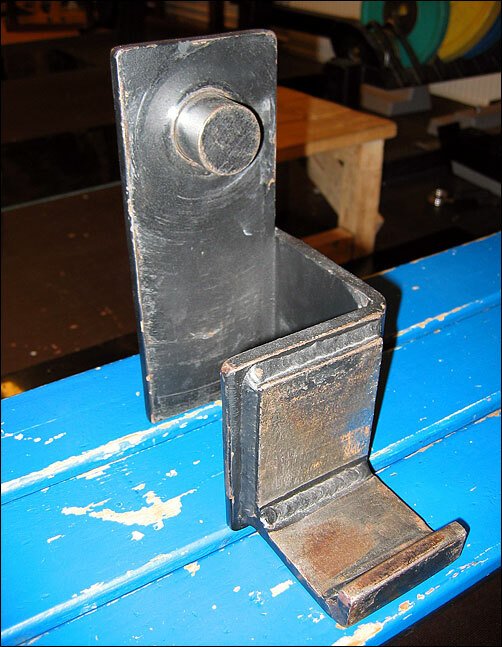 The blueprint of the rack hooks that left Einstein speechless… If you look past all the nitty-gritties, the concept is simple: one side of a 80x80mm/3.2x3.2″ pipe is sawed off with a piece of 60mm metal welded on the inside to make for a snug fit around the uprights, a hook of 60mm strip is welded to it and a final hole drilled through it to accommodate for the pin that locks it to the rack. Then make another one for it takes two to tango. The bench was a straightforward affair: the main frame is made of 100x150mm/3.9x5.9″ pipe, the horizontal support from the 120mm/4.7″ wide strip and the extensions for bolting the padding to the bench of the 60mm wide strip. 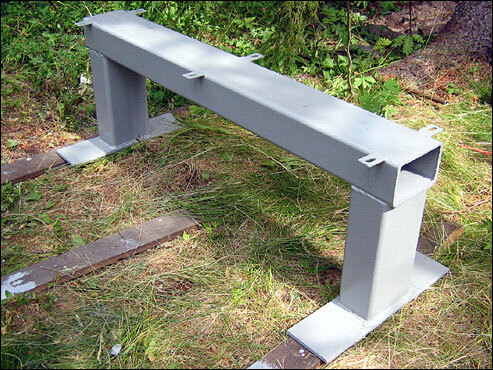 The length of the bench frame is 1.2m/47.3″ and the height 42cm/16.6″. 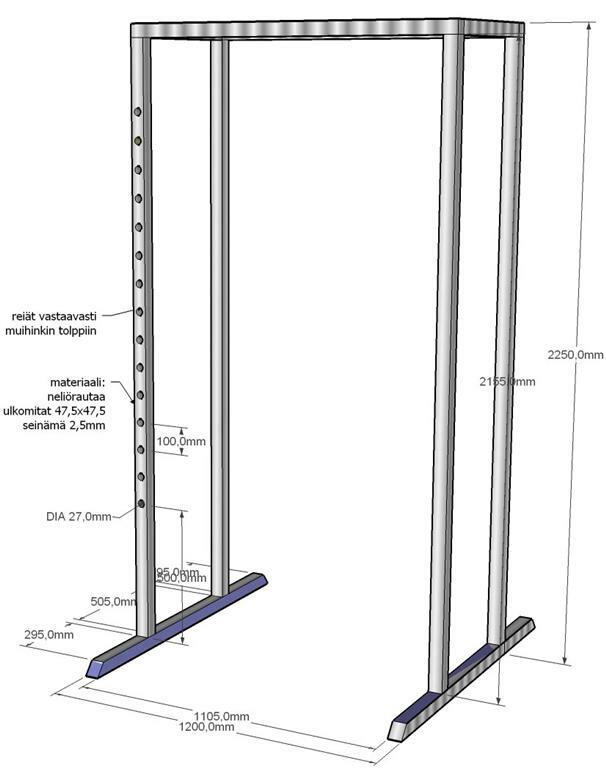 At the bottom of the blueprint, the welder is also asked to saw the thick rods into two 95cm/37.4″ pieces (for the safety pins) and two 15cm/5.9″ pieces (for the rack hooks) with a 6cm long piece of some appropriate piece welded on each at one of the ends to keep the rods from sliding through. Material and blueprints don’t make a rack any more than they make chili con carne. Perhaps it was a bit haphazard to purchase the material before getting a welder to agree to the job, but at least I didn’t risk becoming totally rackless by tearing down the old squat rack before I had my man. I first discussed the welding with my uncle and cousin, both of whom can weld well, but they agreed that this was a job best done by a professional armed with a MIG welder. As I was contemplating where I could find me a welder who would agree to drag both himself and his equipment out to the island, I learned that our new cottage neighbor had his own construction company. My dad had contracted him to replace the windows on the main house and, as it turned out, he readily agreed to have one of his welders come over to weld the rack and bench. Not much later the old squat rack went down. The vengeance of the Ice Age made sure I wasn’t bored while waiting for the welder to show up. A small rock next to the deceased squat rack was lying in the way of the rack floor and had to go. Did some digging around it, a task made tedious by the unfortunate amount of surface roots. Then dug some more. And some more. After a lot of work a huge boulder was finally uncovered. Talk about the tip of an iceberg! After briefly considering various options for chopping off the obnoxious tip of the rock (including dynamite as I have a demolition license), I decided to apply plain old brute force. I managed to budge it a bit with an iron bar and a lever, but it took a winch fastened to a nearby tree and the help of my dad to get it out of the hole. 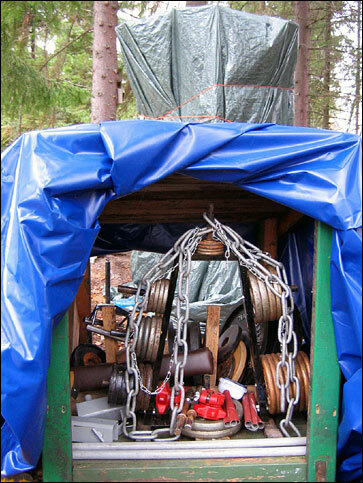 The benching chains came in handy here, but several ropes snapped as soon as we got the boulder going. Decided to leave it belly up close to the rack-to-be as a table and landmark. To say that I dug up lots of rock while preparing the ground for the rack is a crass understatement. This was also as far as I got during the summer of 2004. No welder showed up despite promises for late autumn and Toffe’s Gym was left to hibernate without a rack. As summer came around again the following year, I was determined to get this project moving again. The neighbor confirmed that he was unable to get a welder for me as the original one had been fired and he had found no replacement. The local yellow pages turned up no local hits for welders, but my friend Måns found me a number via Mr. Google. The welder was cautiously optimistic over the phone and asked about the working conditions out on the island. I drove over the next day with the blueprints. He didn’t have to give it more than a quick glance to conclude that it was not worth dragging a lot of heavy equipment out by boat. The thought of dragging all the iron back to the mainland was not fun, but a couple of days later I dumped it at his door step. We agreed that the cross beams of the rack would be bolted instead of welded to allow for easier transport back to the island. Words cannot describe how pleased I was. A few days before the promised deadline of two weeks, I called the welder to inquire about the status. Yes, the rack and bench had been finished late at night the day before. He also told me that the time needed for the project had been catastrophically underestimated from the original 3-4 hours. The large number of holes, 108 in the rack uprights alone, turned out to be the achilles heel. The large diameter had forced them to use three separate drills of increasing size. When it finally dawned on them how many holes they had to do work was already well underway. While he went off to do the math, I braced myself for financial disaster. He called me back and actually asked if I was sitting. Twenty hours of work at 43 euros/hour, or 860 euros/1044 US dollars! He proceeded to say that he realizes that this is a far shot from what we agreed on and that he would be willing to give me a 50% discount. I thanked him profusely for his kindness and then booked myself a trailer from the nearest gas station. By this time, I had changed my mind about the flooring. 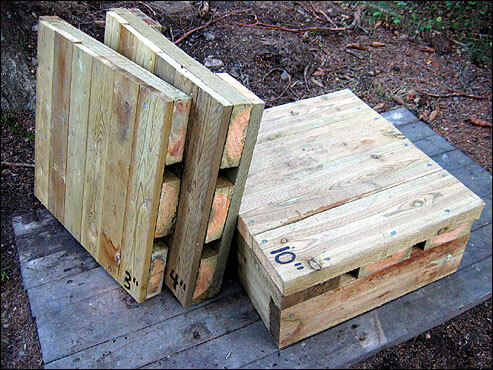 The base would be totally made of concrete and then covered with a layer of wood to keep it from chipping. 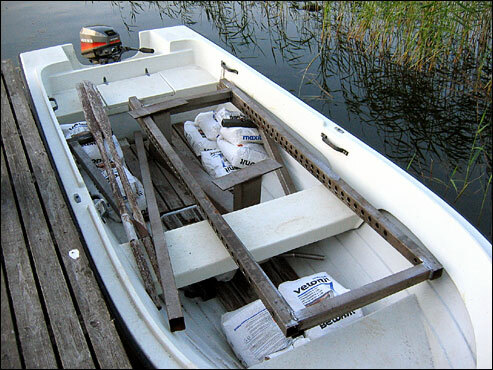 Thus took a detour via K-Rauta, a large hardware store, to pick up twenty-five 25 kg bags of ready-mixed concrete, half of which got to accompany the rack and bench out to the island. The last thing I wanted was for my rack to go submarine due to having overloaded the boat. All the pieces of the rack immortalized at the end of a very long day. 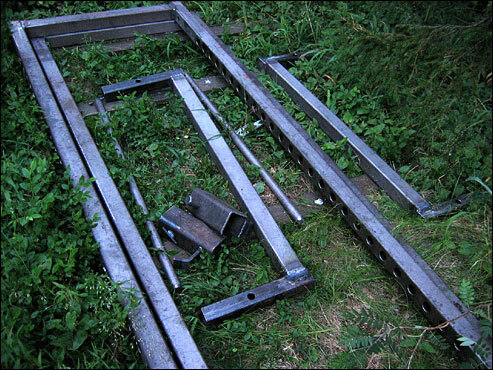 Note how the upper cross-beams have been joined to pieces of 50x50mm/2x2″ pipe that were to be inserted into the side frames and secured by bolting. It was a joy to see how shiny the formerly rusty iron had become thanks to sand blasting. The next day I went shopping for paint. It was not easy to decide what color I wanted, but finally settled for grey over green. Bought 1 liter of metal primer (to protect against rust) and metal paint each. With no rain in sight, I started the time consuming work of applying metal primer to all parts. 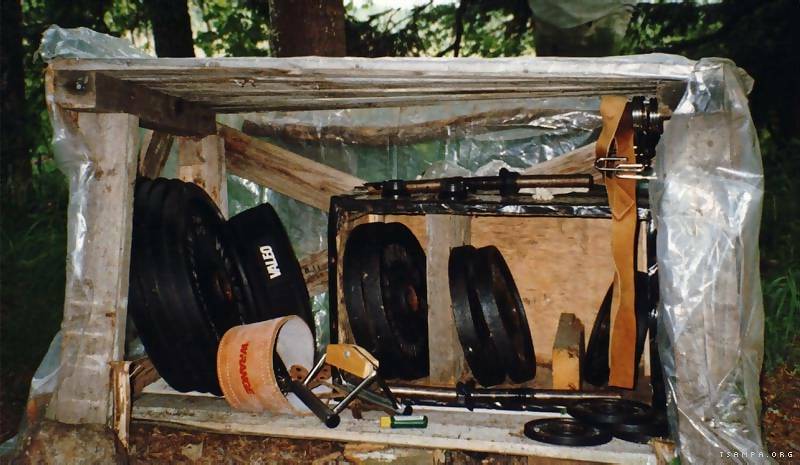 Before long, rack pieces were stacked up against rocks, my old Weider bench, even hung from trees, to dry. I also painted a piece of plywood I had bought for the bench with some old white wood primer I found in our shed (right). Note the stack of concrete in the background (left corner). Close-up of the untreated plywood on top of the partially painted bench. 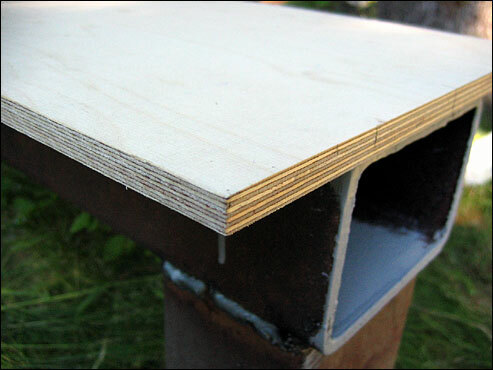 The plywood is 12mm/0.5″ thick, nine layered birch. I had to cough up 50 euros for it, since they would not sell smaller pieces than 1220x2440mm/48x96″. On the bright side, I had them cut out several 1200x300mm/47.2x11.8″ pieces for use as spare parts. 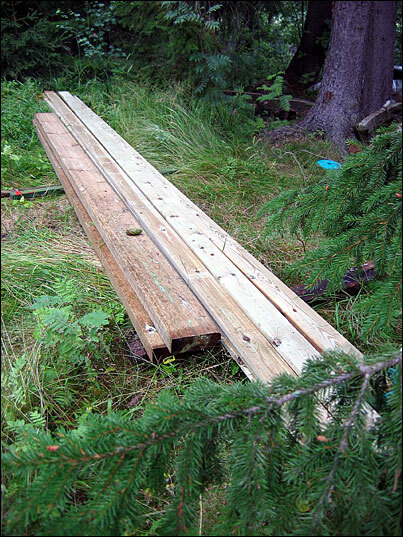 I could have gotten 12mm/0.5″ thick five-layered pine at half the price, but that didn’t appear sturdy enough. 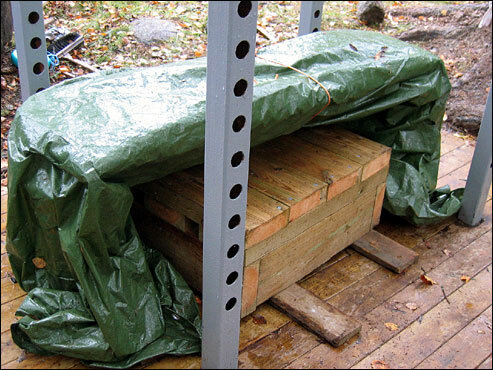 After all, the plywood needs not only to support whatever loads the lifter is using but must also be sturdy enough to allow the bench to be lifted from it. When the bench weighs at least 50kg/111 lbs, you don’t want pine. 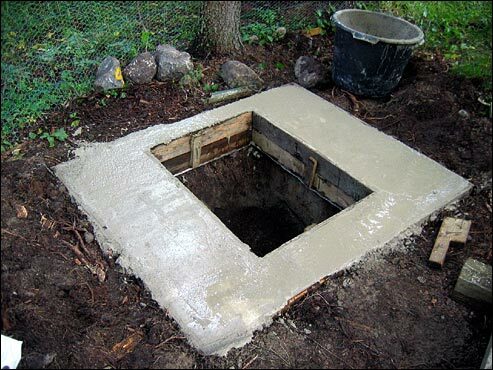 One of the most important things when concreting is to have a solid frame that delimits the area precisely. 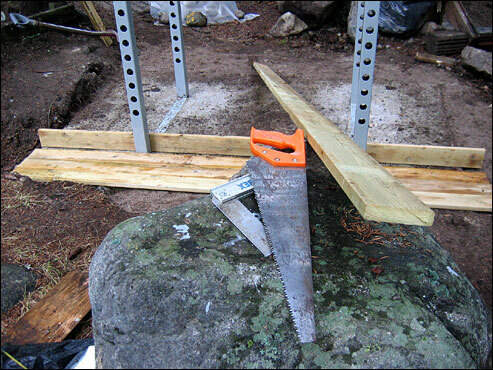 With a level frame around the rack, it is a simple matter to even out the concrete by pulling a board across the frame. The floor originally built for my younger brother’s table tennis needs was a good place to bang the frame together out of some scrap wood. Getting both the concreting frame and the now assembled rack to be perfectly level in all directions took almost a whole day of minor adjusting. A spirit level is essential in this line of business. To save concrete, part of the massive amount of rocks and stones went in, but I made sure that they weren’t anywhere close to what would be the top of the floor to ensure a thick layer of concrete all over. 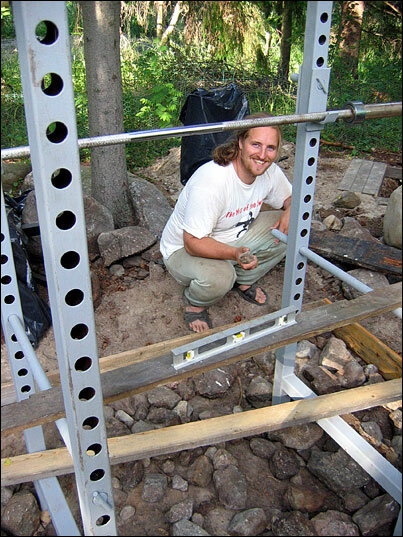 Nearly a week after the welded rack arrived by boat to Toffe’s Gym, it was finally time for the concrete. Once again, I was very thankful that dad had time to join in on the fun. Since we didn’t have a concrete mixer, we mixed all twenty-five bags by shovel. Well-mixed concrete, in this case 2.8 liters of water to every 25 kg/55 lbs of ready-mixed concrete, carries an uncanny resemblance to fresh dung… 625 kg/1381 lbs of concrete and about two hours later, we were only about half way there. The next day, I went back for 20 sacks more for 4 euros/4.9 dollars a pop. Without a trailer, I had to grab 10 sacks at a time in the trunk. I was pretty beat in the evening, but the show had to go on. Come nightfall the rack was fully surrounded by concrete. Special forces commando in full gear. You only need to look at the clothes to realize why it is important to protect the eyes and mouth when pouring dry concrete for mixing. 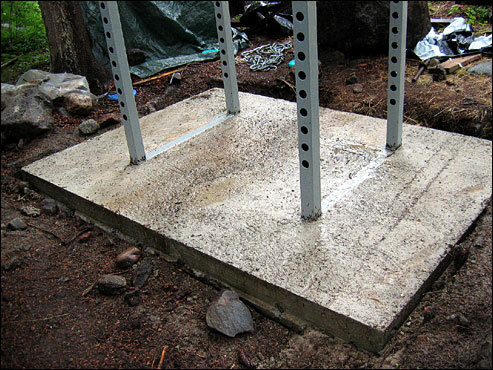 Concrete usually needs three days to settle during which time it should covered to prevent premature moisture loss. Luckily, this coincided with a short trip back to Helsinki. As soon as I returned to the scene of the concrete, I removed the plastic and concreting frame. Voilà! After having applied the second layer of paint, a tad darker grey than the primer, I levelled the ground to fill all gaps between the concrete base and its surroundings and built a wooden floor on top of it all. I ended up attaching the boards to each other both by nailing them together and by placing cross-boards under each side. Nice n’ level. 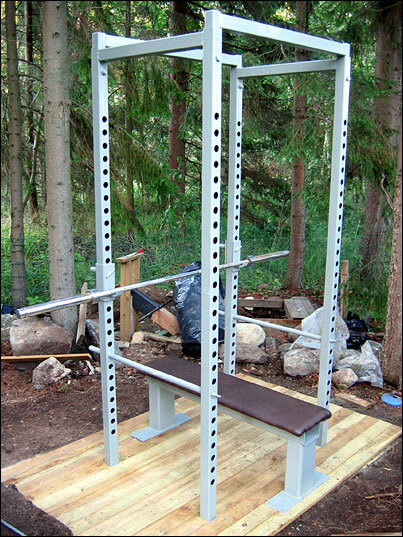 The only thing that now stood between me and a full-blown bench workout in my new rack was the half-finished bench. Here it is with the final layer of paint. For the actual padding I bought two 12mm/0.5″ thick closed-cell foam camping mats, which I’ve heard that others have used with good success. 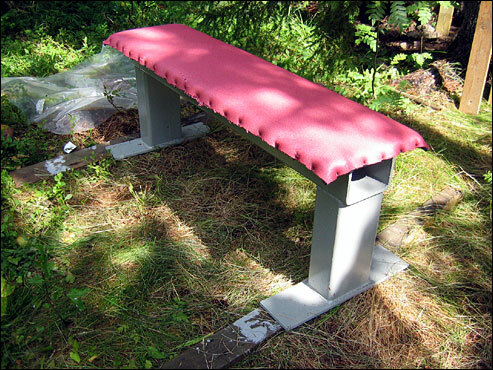 After having painted the plywood with the same second layer paint as the bench itself and bolted it to the bench, the first layer of padding was secured with flat-headed nails. A layer of strong glue would probably not have been a bad idea either. To give a bit of padding to the sides and to avoid nails directly under the lifter, the second layer was allowed to go over the sides. I’m not sure padding on the side is necessary, but it doesn’t seem to hurt either. 12mm/0.5″ of plywood on top of the 42cm/16.6″ high bench frame followed by 24mm/1″ of padding makes the final bench 45.6cm/17.9″ high, 32.4cm/12.8″ wide and 1.2m/47.3″ long. 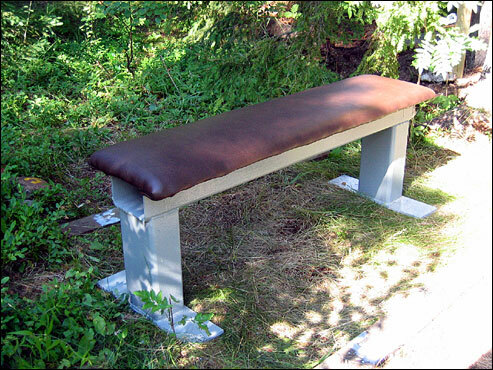 I opted to drape the bench in artificial leather, which is very commonly used on benches. The vendor told me that it is also used, among other things, on the seat of jet skis and should thus be somewhat rain resistant. That said, I’ll prefer to cover the bench. I paid 18 euro for a piece that was about double the amount I needed. After having cut out a suitable piece, I fastened the leather to the underside of the bench with flat-headed nails. I also loosened the bolts temporarily so that I could get the leather in between the frame and the plywood at the ends of the bench. Done. Happy. Finally! The pride of Toffe’s Gym (sans one board at the back of the floor that was added later). Rufus was as happy as his dad to see the project finished. Was it because he has already been bitten by the iron bug at the tender age of 5 months, or because dad would now have more time to play with him again…? The future will tell, but in the meantime I would like to thank my half-wife (aka fiancée) Sanna for supporting me throughout this project, my dad for helping me with many aspects of the project, my mom for feeding and encouraging me, the welder for being both proficient and a very good sport, and finally, all the people on the internet who have bothered to publish information on their own rack/bench projects. If this lengthy pictorial helps or inspires anyone, it shall be worth the hours it took to compile it. I love you all, good night and so on and so on. Below is the total hardware cost of the rack and bench. Note that there was some surplus material left, such as 8 bags of concrete and the beams I originally wanted for the wooden floor. 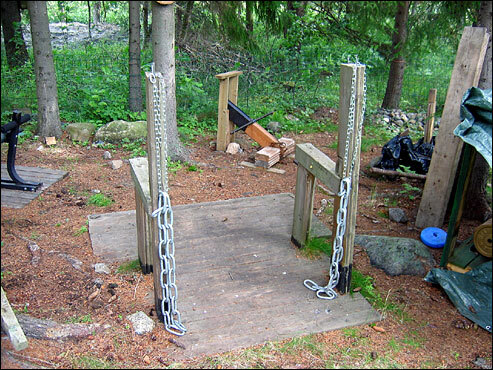 On the other hand, nails, tools, wood primer, scrap wood and such were available at the summer cottage, so they are not included in the total cost. Also, Finland is not a particularly cheap country and you are liable to find that you can get it done cheaper in other parts of the world such as the United States. 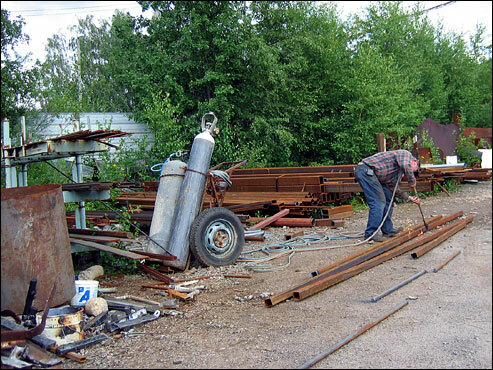 The moral of the story is that you should consult carefully with the welder, especially in regard to drilling costs. At least in this situation, the number of holes in the rack (27 in each upright) was the factor that determined price the most. 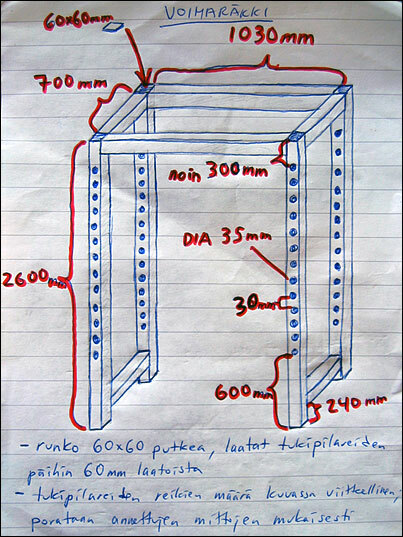 Also, if you are going to build a rack for inside use you can deduct the concrete, the metal primer and the wood, which will put the price of the rack and bench at approximately 690 euros/838 US dollars given an identical price level. Much money can also be saved on the bench if it is built from smaller pipe. Compared with the rack/bench combo I was considering as an alternative to building my own, I saved about 300 euros plus shipping, but also got a much sturdier bench and an open base rack designed to be placed in concrete instead of bolted to the floor. Even if there wouldn’t have been a negligible price difference, the joy of having designed and implemented my own rack and bench from scratch would have made it worth it anyway. Adminin projekti: This thread over at Westsidebar details the journey towards a self-made fully equipped powerlifting gym that goes all the way to pulleys. Even if you don’t read Finnish, you should be able to locate the pictures fairly easily. 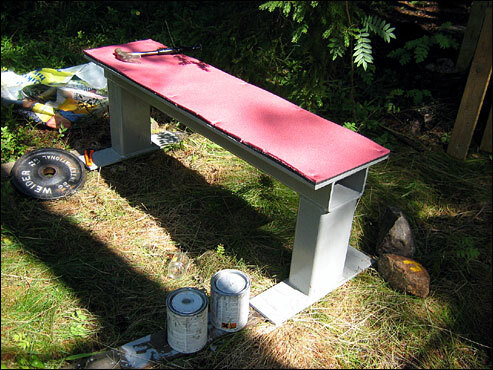 Here’s one of the painted rack and bench and one of the unpainted plate loaded pulley. This thread was very influential in how I designed the bench. 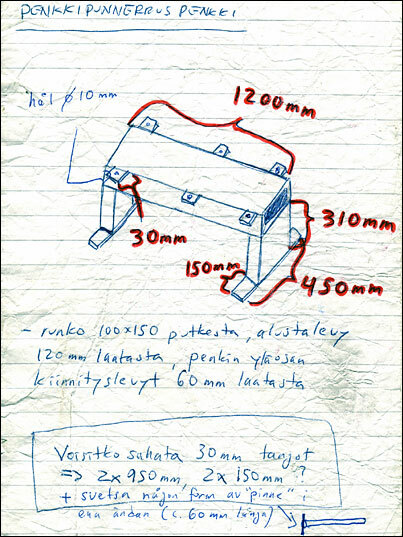 Kuntolaite kotiin: A discussion over at the leading Finnish bodybuilding board Pakkotoisto with a good basic rack blueprint that served me well as a starting point from which to adjust the dimensions up. One reader welded his own according to the blueprint (but with 60x60mm pipe instead of the 47.5x47.5mm) and posted this picture. 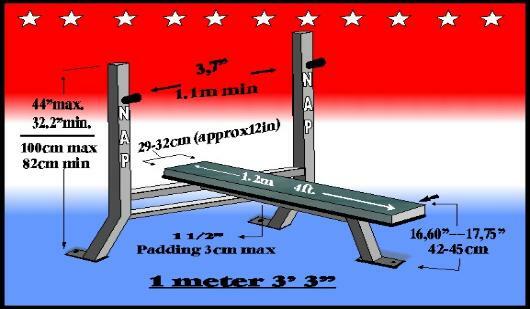 NAP Powerlifting rules: Decided to build my bench according to this federation’s legal specs, mainly because they provided such a good drawing of it. 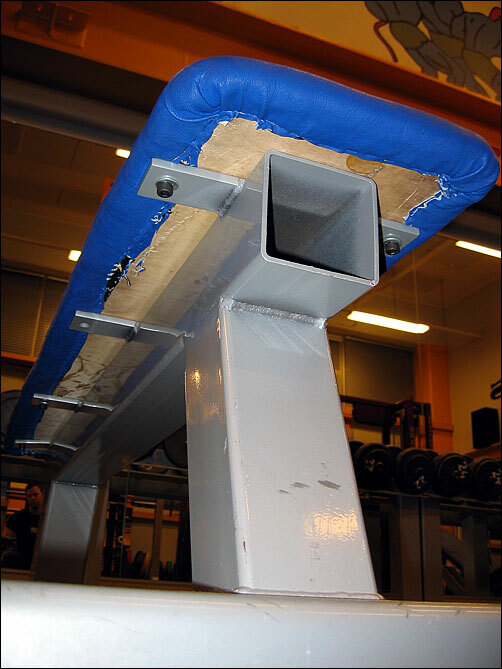 FWIW, besides certain manufacturer requirements, these measurements are also legal within the IPF (length not less than 1.22m, width 29-32cm, height 42-45cm). Snapped a bunch of pictures of the custom-made Kraftwerk equipment at Mayor’s, the gym I trained at last year. 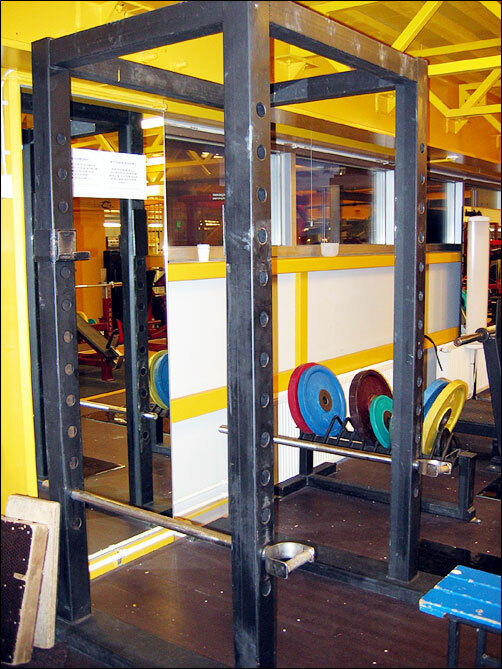 This equipment, formerly part of Gold’s Gym Helsinki, is from the overkill sturdy end of the spectrum. Pictures: the most massive rack I’ve ever seen, close-up of the rack hooks, heavy duty bench press and regular movable bench. How to Build Your Own Power Rack: I wouldn’t consider a non-welded rack, but this detailed page is well worth a look for any rack constructor. New York Barbells’ Racks and Gyms: Before finally settling for a full rack, I took a close look at alternative smaller designs such as the power cage and the mini portable power rack. 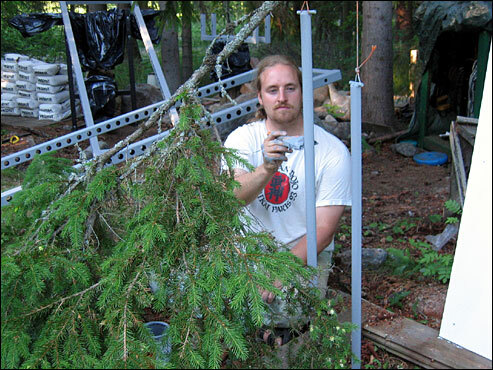 Let me tell you that building a power rack in a forrest demands a surprising amount of work. 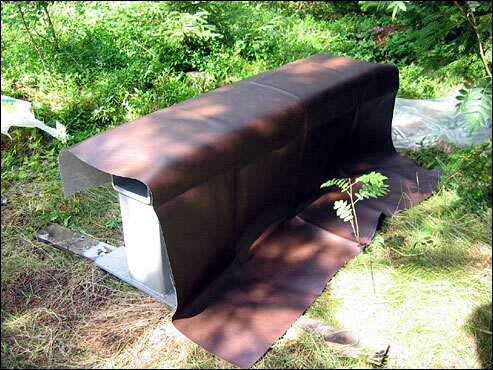 When we left the summer cottage on July 14th for Rufus’s routine check-up in Helsinki, the rack was standing solidly in concrete and covered in a final layer of dark grey paint. I had hoped to get in at least one workout before departure, but as the concrete was to be covered for three full days to prevent premature moisture loss (especially needed in this heat! ), I refrained. There was still a wooden floor to be made for the rack and the padding for my bench was also not quite ready. I will refrain from spilling the beans before everything is complete, but here’s a sneak preview of yours truly’s dad and yours truly in the midst of concrete frenzy. Finished the weight pit by building the top structure for it. In the process, I also decided I wanted it a tad deeper to allow for an extreme range of motion if needed. 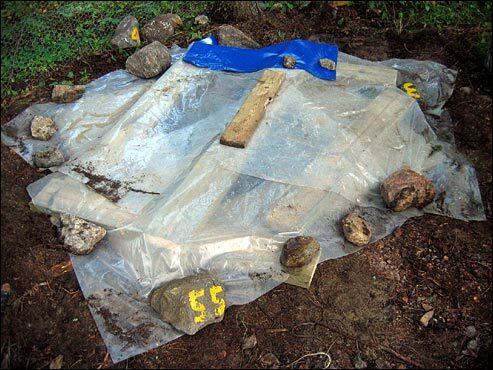 Unfortunately, Murphy’s law dictates that when digging in forrests large rocks will always materialize where they do most harm. After barely managing to deadlift the largest one out of there, I promptly added it to the growing collection of lifting stones I plan to have at Toffe’s Gym. 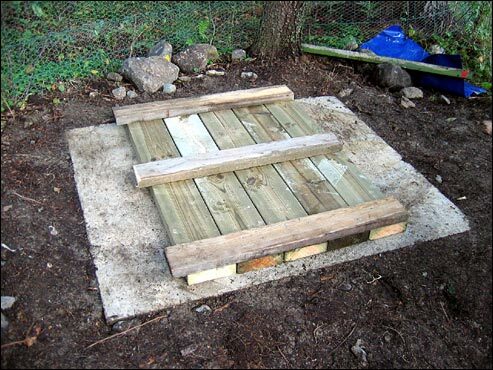 The top structure is basically a lid made of treated wood (floor boards from my retired squat rack) resting on a lot of carefully placed stones to make it perfectly level in all directions. I did my share of jumping on it to verify that it is indeed rock solid, but might concrete it in a year or three if this turns into a permanent attraction. Whenever I build something for my gym, my motto is that it should be able to accomodate whatever unexpected strong company I might get. 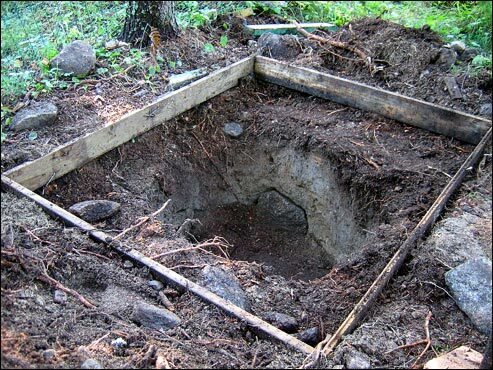 The measurements for the finished pit are as follows: depth 60cm/23.4″, length 84 cm/32.8″, width 65 cm/25.4″. Besides the now staple handle squat, the measurements should accomodate a very wide range of exercises including bent over rows, curls, forearm rollers, stiff legged handle deadlifts… even shrugs. 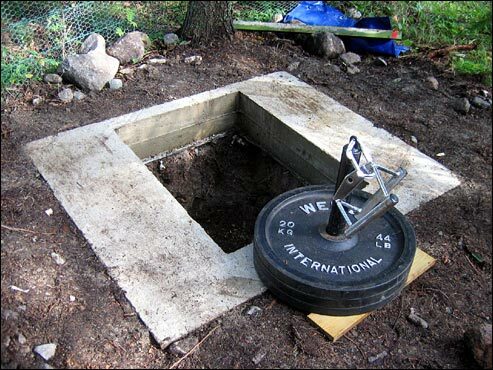 In fact, if you need an outdoor gym on the cheap, a pit combined with some plates, a loading pin and a couple of handles (V-bar, straight) will allow you to do most any exercise where you have the weight below you at the start. Still, your mother is liable to call it a grave. To save my nose for the benefit of mankind, I got myself a board to use as a backrest on the seated pin press. The Spirit of the Barbell nodded in approval as the bar did no longer need to clear Cape Head before moving into a proper groove. Later on in the workout, the board also came in handy as a back rest to assure good form and zero momentum on barbell curls. This simple board is already turning into one of my most useful gym accessories. Partially solved the problem of not having heavy enough dumbells to replace the risky bent over rows (my back) by doing one-handed rows with the barbell. The advantage over dumbells is that you can pull very close to your waist as there are no plates to hit the thighs, but you can’t move the supporting leg much out to the side like I usually do since the bar is in the way. Some gentle swaying aside, bar balance is not the huge problem it might first appear to be. 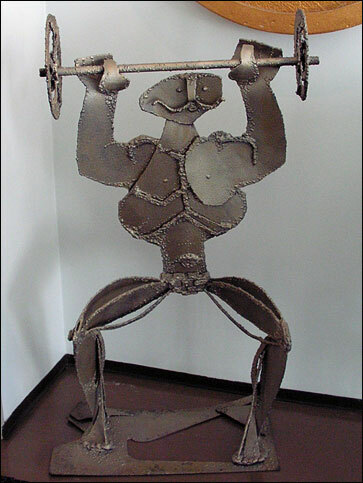 Psychologically, the bar also works well since 40 kg/88 lbs on a barbell looks puny whereas a dumbell of the same size is already borderline imposing. Too bad the gym doesn’t have two bars, otherwise I could go back to doing heavy dumbell benching… dumbells are for sissies, right? Took full advantage of the school’s carpentry facilities and made myself a 2″/5 cm wooden pinch grip block to reinforce my grip tool arsenal consisting of the Captains of Crush (CoC) Trainer and I grippers and a Rolling Thunder (RT) with loading pin. I haven’t done much work with the RT of late as it has been safely stashed away in my locker at the commercial gym. Since I now call the school gym home, I finally went ahead and dragged my chalk, RT, mini bands etc. over. Will start working the RT twice a week in an attempt to get my max up to 60 kg/133 lbs from its current 50 kg/111 lbs. I was still aching from Monday’s heavy pressing and reluctantly concluded that the wisest thing to do was to forego the normal Friday action. Instead dedicated the workout to grip and forearm work. The pinch block was fun, and it was again painfully revealed just how stronger my left hand pinch grip is when I hit 20 kg/44 lbs… Wrapped up with some incline shrugs and jungle pulldowns followed by a set of rocket power abs where I managed a new PR of 3 reps despite having pretty sore abs from Wednesday. Måns also did some heavy Pjotr rows that I captured on today’s clip (3.6M). Yellow leaves against a clear blue sky. 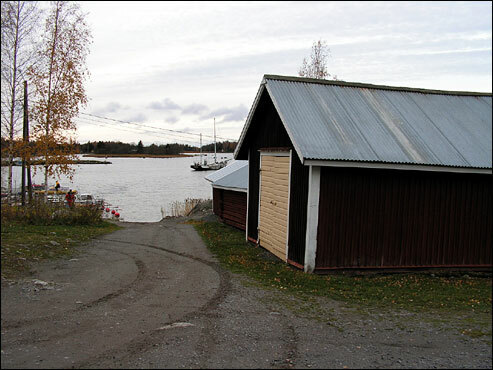 It was a good weekend to prepare our summer cottage for yet another winter. Besides the usual boat and furniture business, it was also time to hibernate Toffe’s Gym. Sprayed some anti-corrosive agent on some of the plates and wrapped everything tight. The gym is not quite in the state I had hoped it would be in at this point since the welder has so far been unable to fit an excursion out to the island into his schedule. My best guess is that the power rack and the bench will be welded sometime in October, when the guy should show up to renovate the windows in our main cottage. 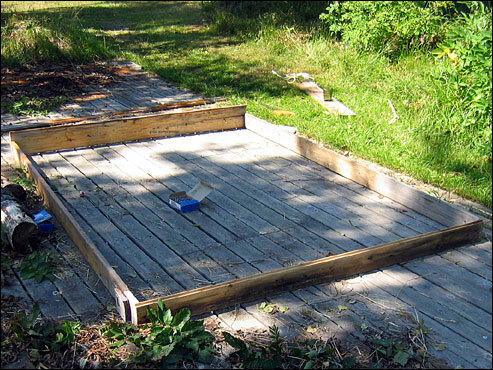 If it is then too cold to paint it and concrete it into place remains to be seen. 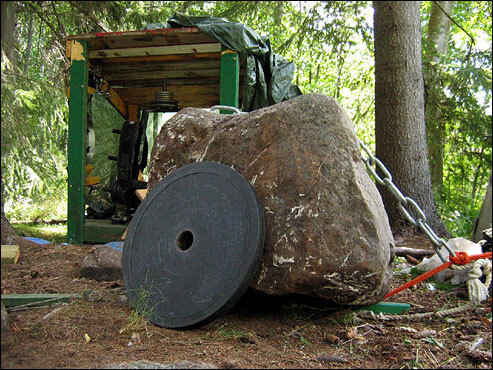 Who knows, maybe I will still give the old barbell a spin in the woods this side of Christmas. 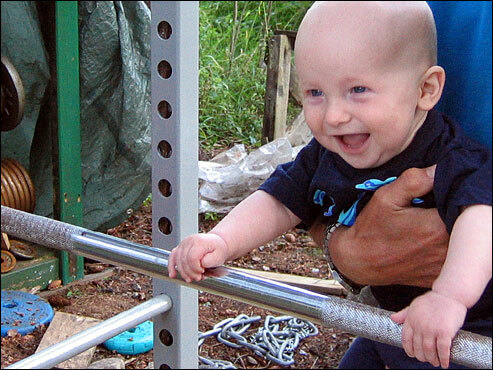 32 year old natural raw powerlifter from Finland, currently a stay at home dad with son Rufus (14 years, 2 months and 3 days old). For more, see the progress matrix. Under the Bar is 15 years, 11 months and 8 days old with 462 posts, 329 photos, 108 video clips (363 M worth) and a bunch of comments.